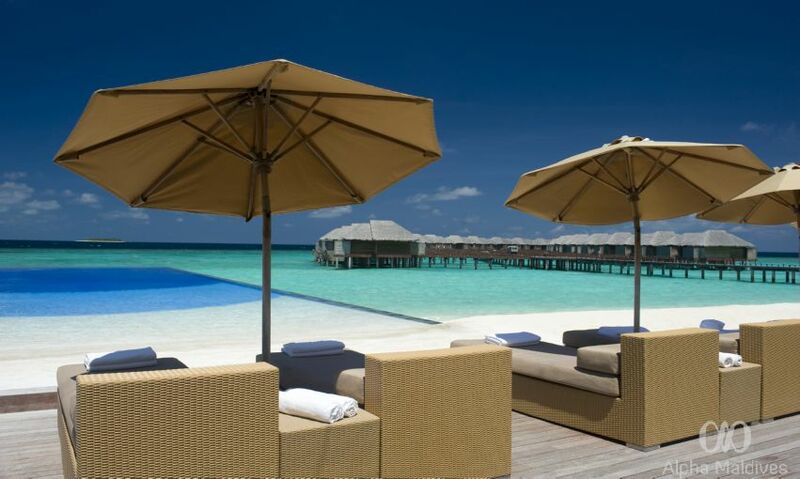 JA Manafaru Luxury Resort in the Maldives - Alpha Maldives. 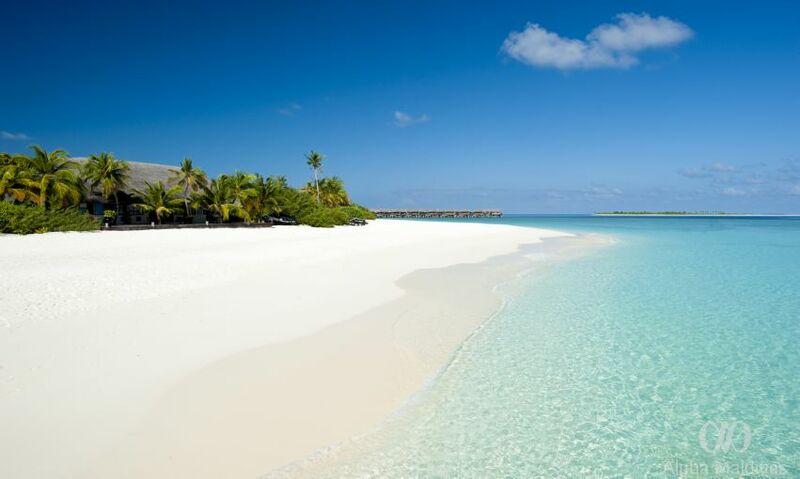 Nestled in the northern tip of the Maldive islands, JA Manafaru is a haven of serenity and natural bliss. A 75 minute seaplane ride atop the Indian Ocean and the pearl like scattered islands will get you to the island, where you will be met with lush vegetation and private luxury paired with top-notch service. 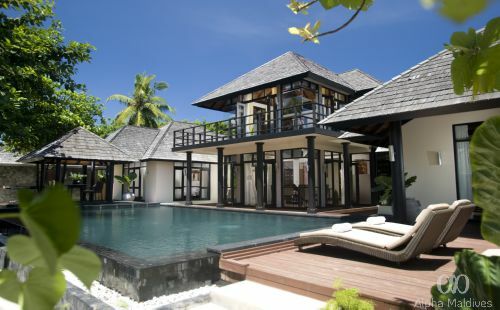 This tropical escapade comprises of 84 villas with an array of six types to tend to your personal needs. Designed with intricate details and personalized touches to exemplify the rich aesthetic heritage of Maldives, these villas are equipped with modern facilities and are elegantly furnished to complement the unparalleled tropical beauty of the island. Nestled away in the tropical forest amid the salty air, these 150 square metres bungalows are spacious and comfortably furnished. 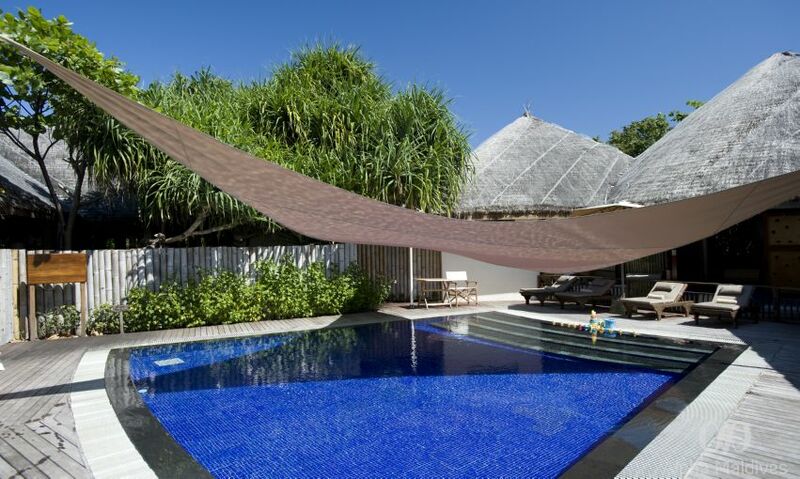 Whether you’d like to tan in your sun lounger, or take a swim in the plunge pool, or simply relax and read on your day bed while marveling at the calming view from your private beach cabana, this bungalow has it all. 150sqm (1615sqf) - indoor: 45sqm (484sqf) / outdoor: 105sqm (1131sqf). 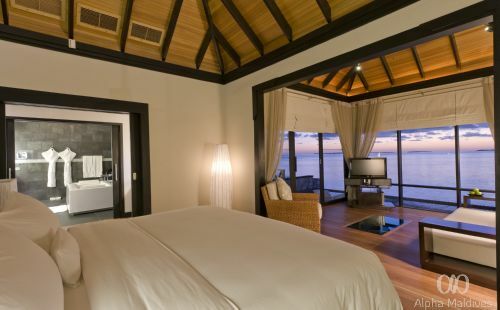 Experience the panoramic view of true Maldivian sunrise over the Indian Ocean here at Sunrise Water Villa. Revel in the spectacle of colours as the gentle waves lap against the private deck and over-water hammock. With attention to detail, the villas give you a mesmerizing view of the lavish marine life through the glass-paneled floors. The infinity plunge pool and partially open –air bathroom is also luxuriantly designed. Note: For safety purposes, Water Villas are not recommended for children below 12 years. Not an early bird? The Sunset Water Villa with its neutral and earthy tones welcome you experience balmy, salty evenings coupled with the playful and theatrical sunsets of Mother Nature. Lounge over your over-water hammock or laze in your infinity pool while the sun displays an awe of colours, adding to your romantic getaway. This 110 square metre villa also proudly displays our abundant marine life through glass-paneled floors. Luxuriantly furnished with authentic hand crafted wood, this 225 square metres suite also embodies a spacious living room, an open-air bathroom and a private sundeck. 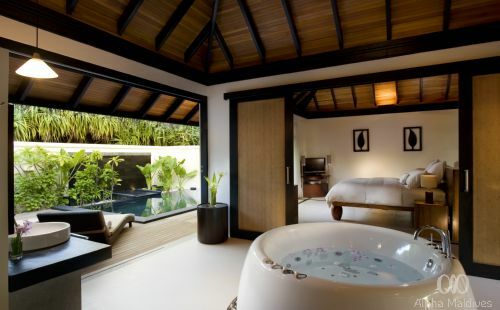 A plunge pool, sun loungers and a private beach cabana invitingly awaits you at the One Bedroom Beach Suite. 225 sqm (1184sqf) - indoor: 80sqm (753sqf) / outdoor: 145sqm (431sqf). 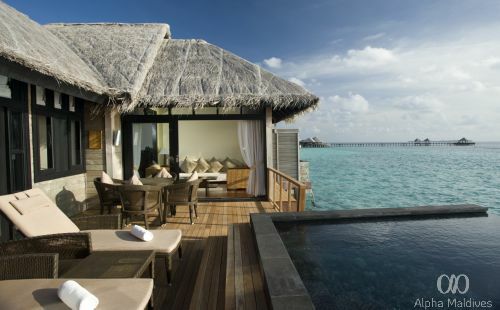 Perched at the tip of the water villas, this suite is your ultimate vacation escapade packed in one. 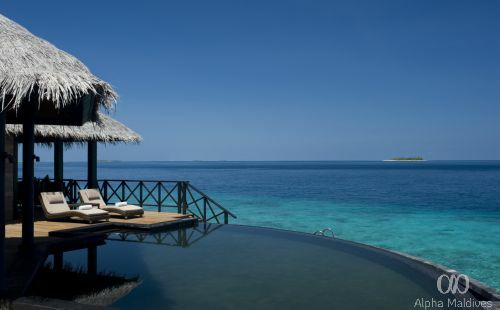 While sun loungers, a vast infinity pool and an outdoor dining table beckons you to the outdoor deck with the dazzling view of pure turquoise waters and uninhabited islands from afar, the undisturbed horizon of the Indian Ocean continues to entice you even from your bedrooms. 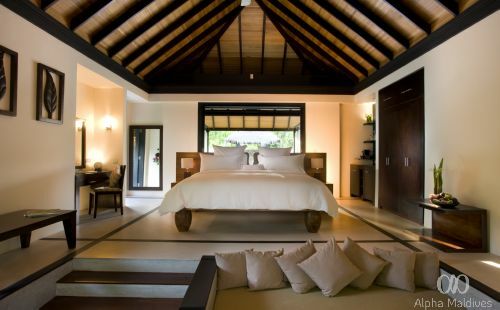 Authentic thatch work covers the roof while the bathrooms display an array of designer luxuries. The Two Bedroom Grand Water Suite can accommodate four guests, and an additional child of under 16 years when requested upon. 350 sqm (3767sqf) - indoor: 165sqm (1776sqf) / outdoor: 185sqm (1991sqf). This haven of serenity and breathtaking beauty comprises of a steam room, sauna, a grand infinity pool and a private spa treatment room, all brimming with sensual luxury. Coupled with two bedrooms and outdoor bathrooms, this two-storey suite comprises of 600 square metres. While a private plunge pool, sun loungers and a daybed welcome you in the master bedroom, the elegantly designed living and dining area gives way to a sundeck. 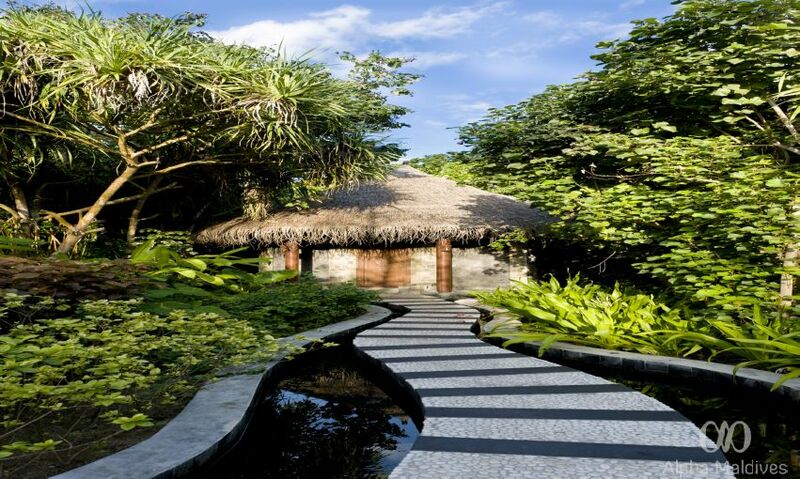 A courtyard of ponds embellishes the entry to the Royal Island Suite while lush foliage paves your way to your private beach area and cabana. Award-winning Asian fusion cuisine with inspiring ocean views. Experience an exotic mix of Chinese, Japanese and Thai speciality dishes and signature creations by the resort’s very own Chef Richard Cross, renown as a pioneer of fusion cuisine and a flare for creating exceptional flavours and artistic presentation. Fresh grilled seafood and steaks in an atmospheric beachfront setting, freshly prepared on the live grill and seasoned with organic herbs, fresh from the island’s garden. 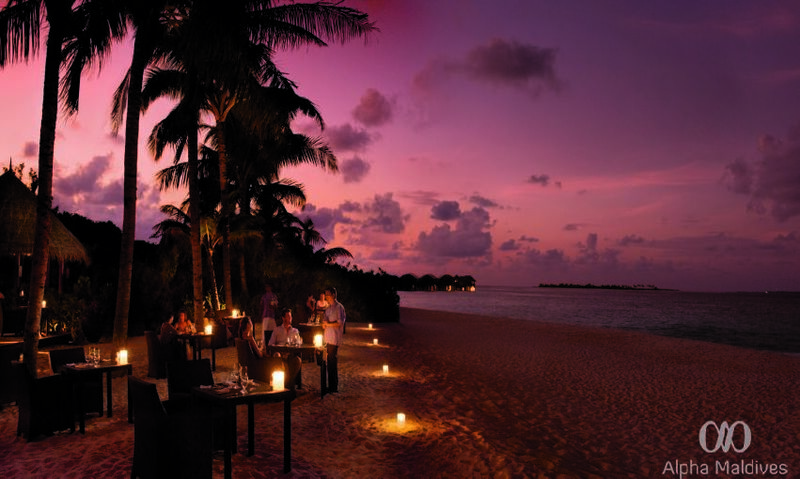 Enjoy the evening island breeze permeated with delicious scents and fresh flavours for a fabulous dining experience under the stars. 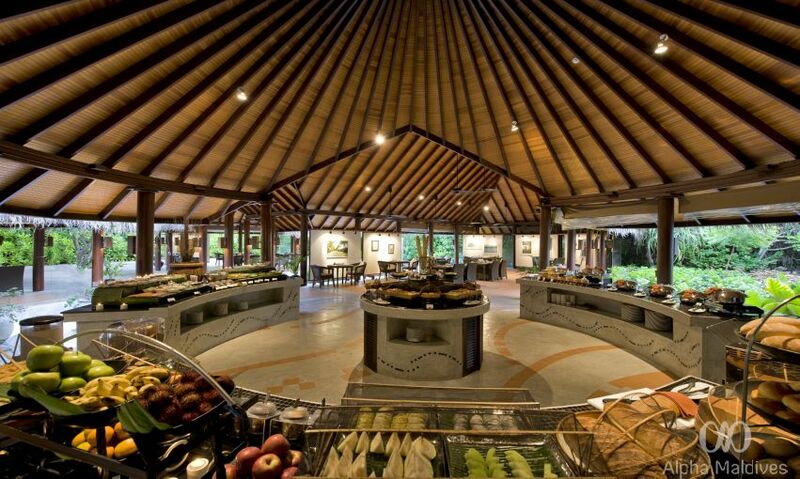 Serving local and international buffet for breakfast and special theme nights of international and Maldivian cuisine. Start your day on the island with the ultimate breakfast experience at Kakuni, a spectacular buffet with a gourmet options from across the globe. 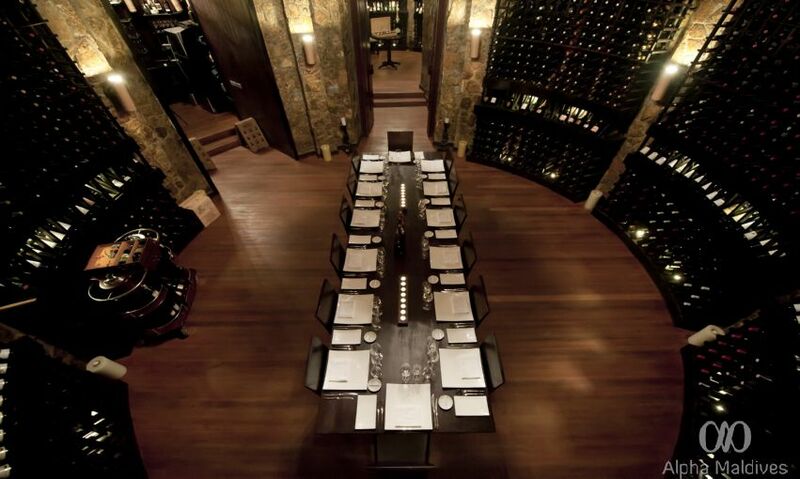 Situated two and a half metres below sea level, The Cellar offers an extensive selection of fine wines from prestigious vineyards around the world. 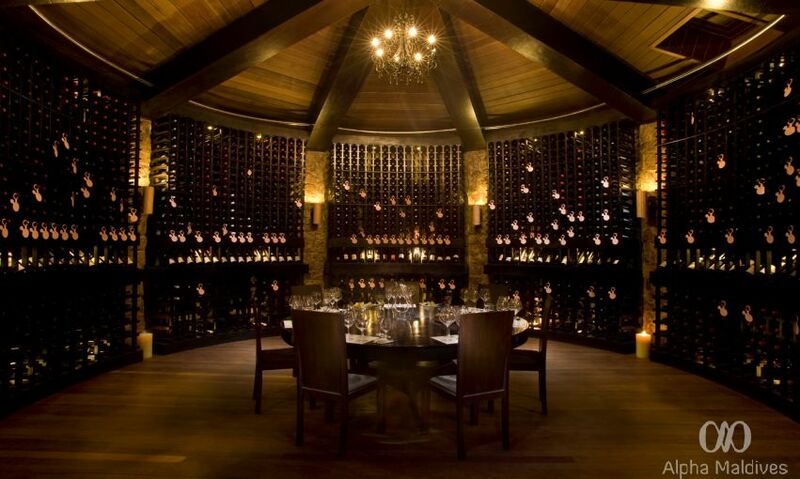 Experience haute cuisine and explore the award winning ‘wine cave’ in this romantic underground haven. Open for lunch and dinner; enjoy a kaleidoscope of colours, fragrances and flavours with a home-made pizza, pasta and salads, nestled within a lush oasis around the resort pool - bellissimo! With seamless views to the horizon, Infinity Pool Bar is the perfect spot to savour a fresh salad, delicious sandwich or light snack, throughout the day. 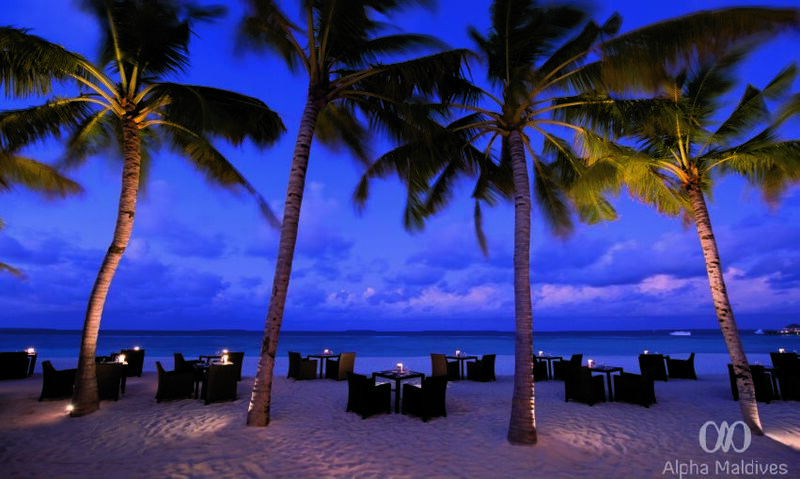 Make your visit to JA Manafaru complete by taking the time to experience a blissful sunset at Horizon Lounge. 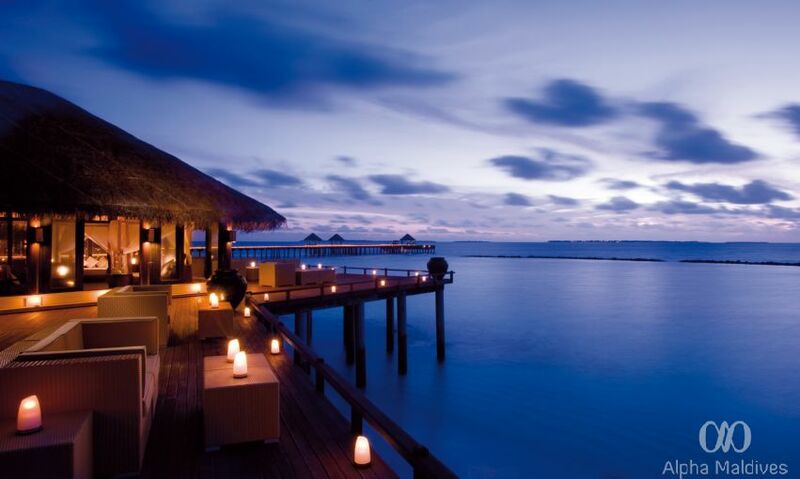 Relaxation will come naturally, as you take in the vibrant changing skyline reflected across the pristine waters with a signature cocktail in hand. Nestled deep within the flora and fauna of the island, Calm Spa, alongside the world-renowned partner Aromatherapy Associates, works to revitalise and rejuvenate you inside and outside. The aromatic herb infused Relaxation Garden, sauna and steam room and hydrotherapy bath are some facilities of the spa. Featuring nine private treatment rooms complete with bathtubs and open air showers, Calm Spa uses essential oils and organic products with relaxing, anti-aging properties. 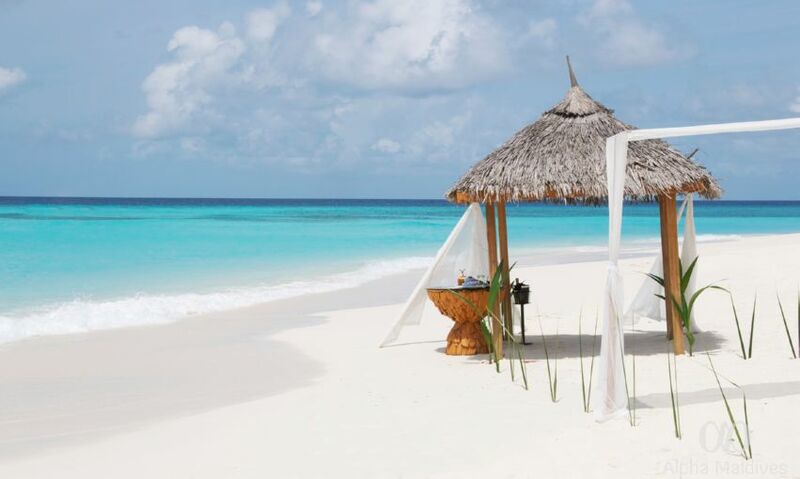 Professional therapists also perform treatments such as Shidehara, Ayurvedic and traditional Maldivian healing rituals. A truly invigorating and cleansing experience, the Calm Spa is a treat for your skin and senses alike. Open from 9 am to 6 pm, Turtle Kids Club is a joyous haven for children. The private pool displays mini daybeds while a game room, mini climbing wall, a bungee trampoline and a herb garden are also featured here. The staff also indulges the children in activities such as cooking classes, crab hunting and pirate dress-up. In addition to Turtle Kids Club, JA Manafaru also has the following amenities and services. This destination is a leisure and recreation area for both children and grown-ups. Adults can spend hours in the simulators while youngsters can enjoy the video games on the X-Box. Other features include a library with a variety of books and magazines in different languages, table tennis, billiard and a diversified offer of board games. The fully equipped fitness center is also located within this complex. Whether it’s tennis, volleyball or indoor games such as billiard and table tennis, Manafaru has just the sport for you. Gym enthusiasts can also make arrangements for personal training sessions, or join one of the group fitness classes at the fitness centre, which is open 24 hours. 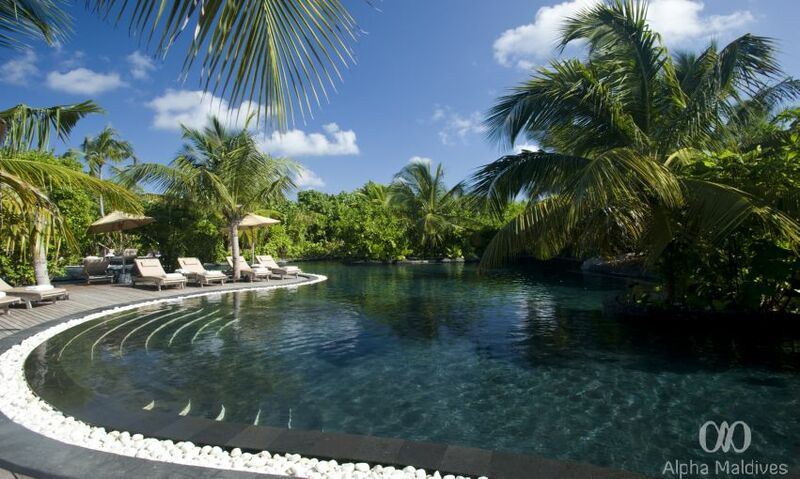 Manafaru also sports three pools in addition to the ones in your villa. VDWS certified instructors are at your service to provide guidance and courses while you try out some of the adrenaline pumping water sports offered at Manafaru. Motorised sports such as jet skiing, wakeboarding, mono-skiing, knee boarding and water skiing will give you a thrill, while windsurfing, kayaking, stand-up paddling and catamaran sailing are some of the recreational ways to explore the waters. 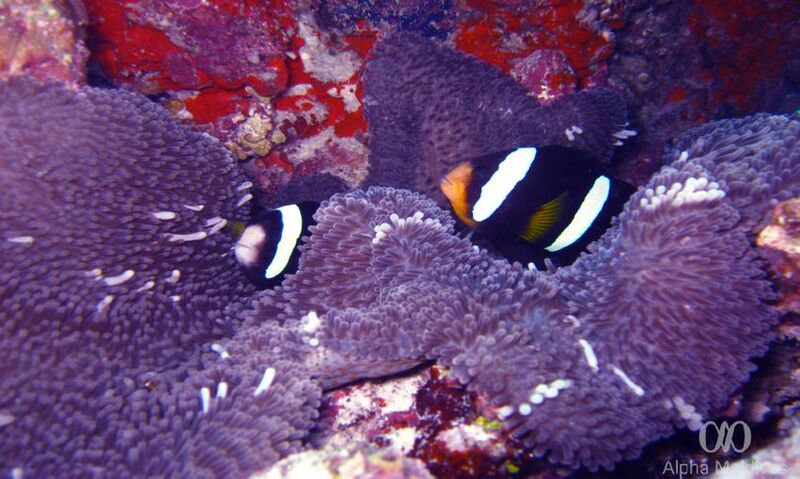 Explore the abundant marine gardens of Haa Alif atoll with our PADI 5 star dive centre crew. Open everyday from 8:30 to 6 pm, PADI 5 star dive centre offers multilingual diving courses on all levels in nine languages, with complimentary snorkeling gear. House reefs and local dive sites brimming with life enthralls both novices and dive masters, while the keen mentorship of the crew ensures your safety.